Our World Football Specialist Program was formed to allow students with a passion for the game of World Football to train and develop under the skilled guidance of elite coaches. The program aims to provide students (boys and girls) the opportunity to develop their football potential towards the 'elite' level, while maintaining their performance in academic studies. All coaches are accredited with a minimum FFA/AFC C Licence and have vast playing and coaching experience, including current and former A-League and W-League footballers. Many of our program graduates have continued their pursuit of excellence on the field and now play professional football, both here in Australia and abroad! 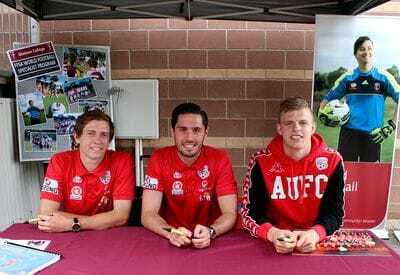 PHOTO (L-R): Adelaide United FC Players and Gleeson Old Scholars Craig Goodwin, Dylan McGowan and Jordan Elsey attended Gleeson College Open Night.